After a two year hiatus due to World War I, the Speedway began racing again in 1919. 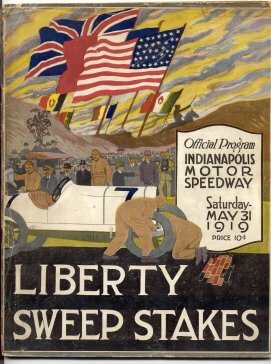 In celebration of the Allied victory in WWI, the Speedway renamed the race the "Liberty Sweep Stakes". The 1919 program cover is probably one of the nicest covers the Speedway has ever produced with the flags of the allied victors of World War I displayed at the top (there’s even a biplane in the sky to the right of the American flag) and a crowd of people watching the race as mechanics work on a car in the middle. The 1919 program measures 8 1x2" by 11" and the price was 10 cents. There are NO page numbers to the 1919 nor for any of the 1920's programs. For 1920, the Speedway again has a classic cover with driver and car chasing the hour glass of time. The program measures the same size as the 1919. The price raises to 15 cents. In 1921, the Speedway went for a more sophisticated look with a dull gray/green background and black script writing. The 1921 measures just a shade under 8 1/2" in width, but is still 11" tall. NO price for the program is listed on the cover. 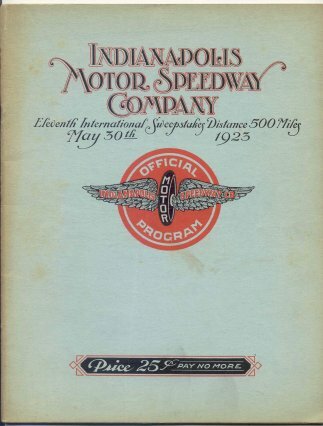 In 1922, the Speedway continued with the sophisticated theme with a yellow/tan cover with black script writing. 1922 marks the first year for an over-sized cover and it measures in at a little over 8 1/2 by a little under 11 1/2. The price raises to 25 cents and the phrase "Pay No More" returns for the first time since 1916 and will remain on programs through 1953. For 1923, the program wanders from the sophisticated theme with a light blue background with a black and red wing and wheel at center with red and black writing. The 1923 program is the same size as the 1920, 8 1/2" x 11". The 1924 program has a tan background with the winged Roman god of speed Mercury at the center. It measures 8 1/2" by a little over 11". The 1925 shows a white background with black and yellow insets and a yellow, black and white eagle at center with a speeding car below. The 1925, 1926 and 1927 have the largest over-sized covers coming in at 8 3/4" by a little under 11 1/2". The 1926 program depicts the front gate to the Speedway in gray with a red passenger car at center with a gray inset and white background. 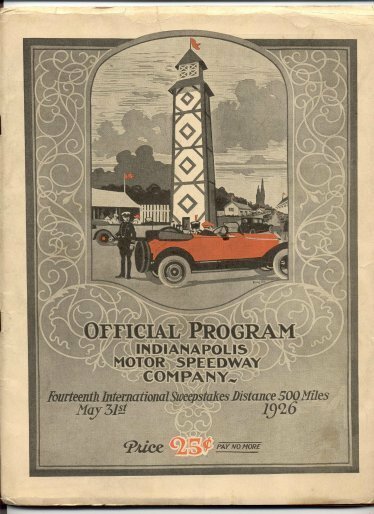 For 1927, the program has a light tan background with a giant holding a race car at center with orange and black writing. 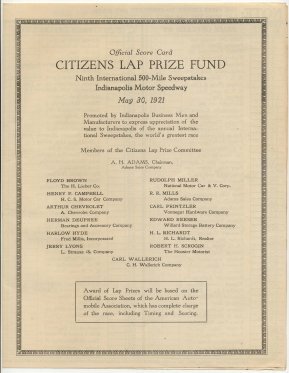 There are at least three different 1927 inserts with the difference being the amount of lap sponsors listed. The 1928 program returns to a more conventional racing cover with a speeding car heading under the checkered flag in red with black writing and white background. The 1928 measures a little smaller than the previous three measuring a little over 8 1/2" x 11 1/4". The 1929 program cover might be called wishful thinking as a kid with his push cart is silhouetted by a real race car. The 1929 measures the same as the 1928. One hits the proverbial brick wall as programs from 1920 and before are very hard to find making the 1919 and 1920 the two toughest post WWI programs to find. They do become easier with 1921 and 1922, but not by much as these two are still very tough, with 1923 and 1924 right behind. The 1925 through 1929 programs become a bit easier with the 1929 being the easiest. The 1928 with it's white cover is tougher to find with a clean bright white cover. If a program has the insert it will add to the value. Programs from this time period did have an issue with pages coming loose from the staples and as some of these programs have no page numbers, it can be hard to tell if pages are missing. One way to tell on programs from this era is with the reprints but unfortunately, one reprint was misprinted which affects page numbers. The inside front cover of an original 1924 program is known to be blank but the 1924 reprint program has the ad from the second page printed on the inside front cover causing a false number of total pages to be counted. Although not affecting page numbers, the 1927 original program has an ad on the inside of the front cover while the reprint does not.